Gettysburg Licensed Battlefield Guide Rich Kohr is the host for the Gettysburg at Arlington series. He is standing by the grave of artilleryman Captain James E. Smith. This view was taken facing north at approximately 4:30 PM on Sunday, May 23, 2010. In the twelfth Arlington post, Gettysburg Licensed Battlefield Guide Rich Kohr presented the gravesite of a Gettysburg Marine killed in Vietnam, an image of 1st Minnesota Veteran Albert Sieber, and the grave of a member of the 1st Michigan Infantry. 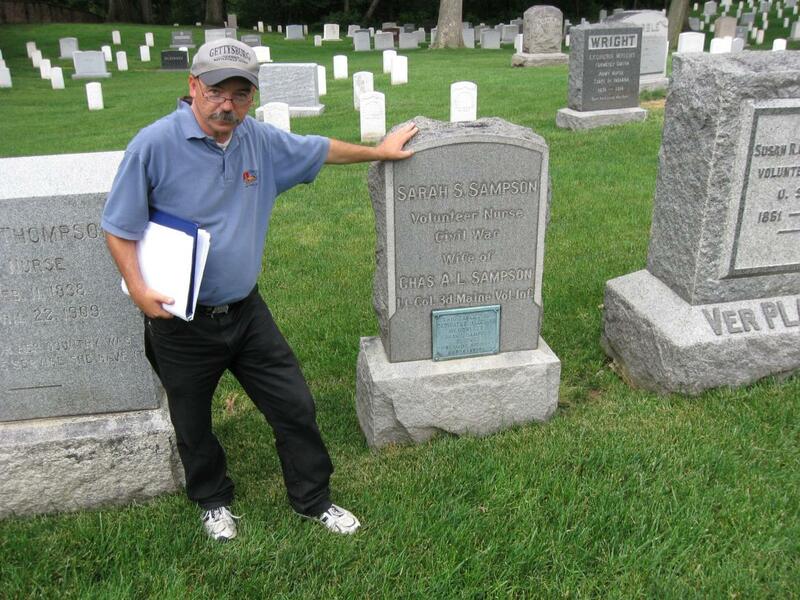 In the thirteenth Arlington post, Gettysburg Licensed Battlefield Guide Rich Kohr showed us the grave of Brigadier General Theordore Jonathan Wint, the Confederate Memorial and Confederate graves of those who had Gettysburg connections. In the fourteenth Arlington post, Rich Kohr showed us the grave of an individual awarded the Congressional Medal of Honor, James Longstreet’s sons, and “Gentle Annie,” Annie Etheridge Hooks. In the fifteenth Arlington post, Gettysburg Licensed Battlefield Guide Rich Kohr presented the graves of photographer and artist William Henry Jackson, Dr. William Henry Forwood, and Brigadier General Benjamin Franklin Kelley. In the sixteenth Arlington post, Rich Kohr presented the unique gravesite of artilleryman Wallace Fitz Randolph, and the burial site of Alexander Wetherill, who was killed at San Juan Hill on July 1, 1898. In today’s Arlington post, Gettysburg Licensed Battlefield Guide Rich Kohr shows us the graves of Captain James Smith, who had some artillery pieces captured at Devil’s Den on July 2, 1863, and Gettysburg nurse Sarah Sampson. This map shows us the locations taken of videos for our Gettysburg at Arlington series. 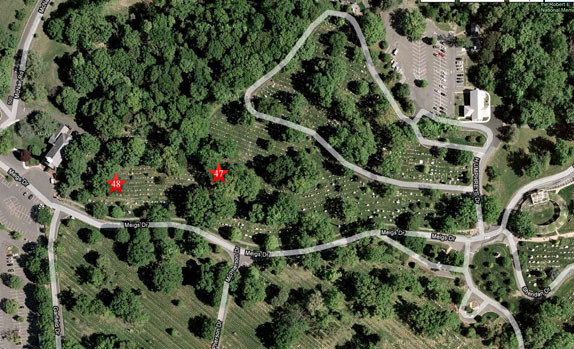 Videos #1-#47 were shown in our previous Arlington posts. Video #47 was taken at the grave of Artilleryman Captain James E. Smith. Video #48 was taken at the grave of Gettysburg nurse Sarah Sampson. This map was created facing north at approximately 12:00 PM on Saturday, June 12, 2010. 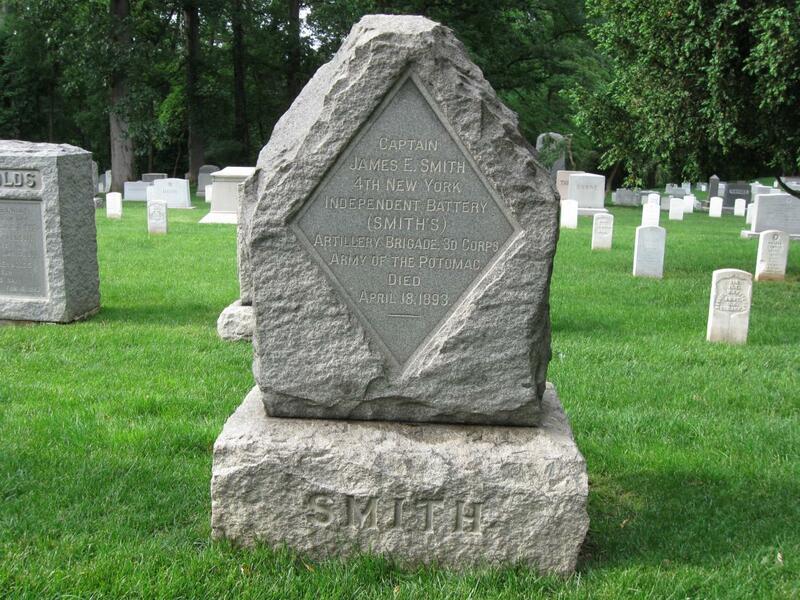 A closer view of Captain Smith’s grave. In a history of his battery written by Smith, A Famous Battery and Its Campaigns…, he claimed that he “was the very last commissioned officer, and I believe the last person to withdraw from the Federal left, occupied by and attached to Ward’s Brigade.” This view was taken facing north at approximately 4:30 PM on Sunday, May 23, 2010. 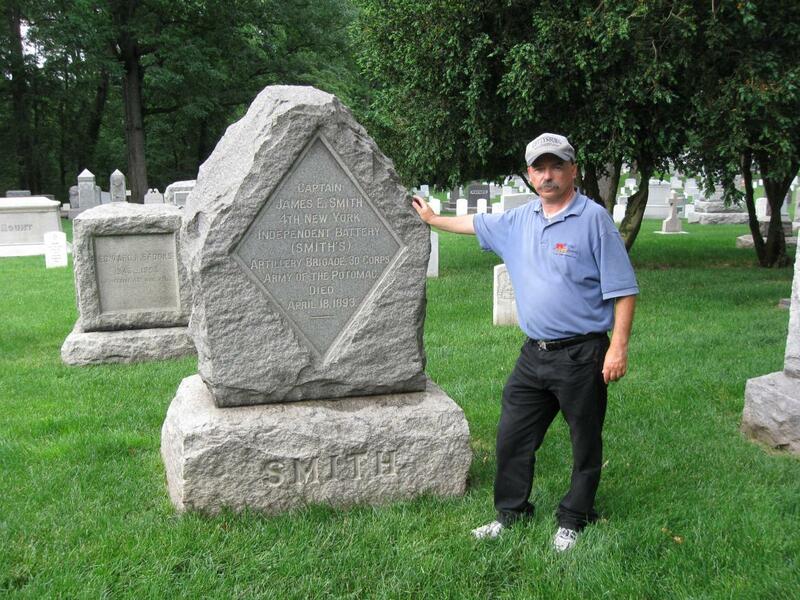 In Video #47 (Videos #1 – #46 were shown in our previous Arlington posts) Gettysburg Licensed Battlefield Guide Rich Kohr shows us the grave of artillerist Captain James E. Smith. This view was taken facing north at approximately 4:30 PM on Sunday, May 23, 2010. Licensed Battlefield Guide Rich Kohr is standing by the grave of Gettysburg nurse Sarah S. Sampson. This view was taken facing northeast at approximately 4:30 PM on Sunday, May 23, 2010. 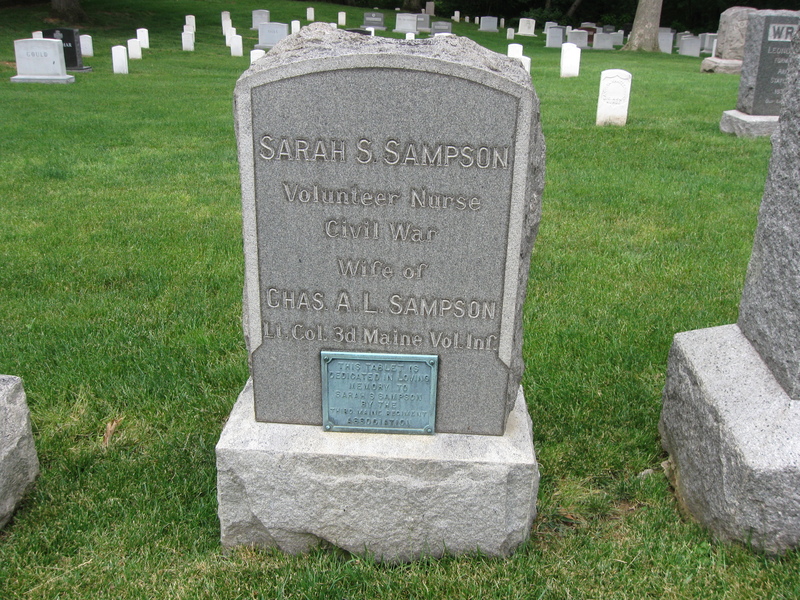 In Video #48 Licensed Battlefield Guide Rich Kohr shows us the grave of nurse Sarah S. Sampson. This view was taken facing southwest to north to northeast at approximately 4:30 PM on Sunday, May 23, 2010. A closer view of Sarah Sampson’s grave. Here is the segment of the letter that she wrote to Maine Governor Abner Coburn on September 15, 1863: “I spent four weeks with our wounded at Gettysburg and returned to Washington only reluctantly though there were others here who had a claim on my attention. From frequent letters in reference to some of our soldiers who are still unable to be moved from Gettysburg, I am thinking to go on again for a short time, in a few days. The agent from New Hampshire has returned and reports that the boards that mark the graves of our soldiers, are many of them displaced by the heavy rains , etc. and need attention. He had carefully replaced all those from his State. I shall be glad when all the members of our association return so that a meeting may be called to make these & other arrangements. I shall visit all the burial grounds & report while I am there.” This view was taken facing north at approximately 4:30 PM on Sunday, May 23, 2010.